Oh I'm sure this is going to be the talk of the awards season, but for now here's our first look. 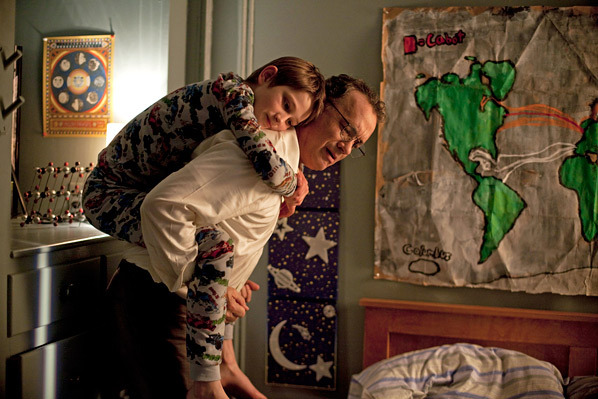 As part of Warner Bros' new Fall Preview, a photo from Stephen Daldry's Extremely Loud and Incredibly Close adaptation was unveiled. The film stars quite a cast, but focuses on Thomas Horn as Oskar Schell. Tom Hanks plays his father, Sandra Bullock his mother. If you're not familiar, the story is about a nine-year-old boy from Manhattan whose father died on 9/11. Two years later, the boy discovers a key belonging to his father, which sends him on a search through the city. And that's why this is such a touching first look reveal. Here's the first look photo and thanks to Collider for high res. Not much, but I'm sure more is coming soon!